Bounce House Rental Blog – Xtreme Jumpers and Slides, Inc.
Can you believe that the first bounce house was called the Space Pillow? That’s what John Scurlock named the vinyl material that covered tennis courts after seeing some of his employees jumping on it. John was a mechanical engineer from Louisiana and made 18oz vinyl into a bounce house. Today, inflatable bounce houses are called many different names by the general public. You will often hear them being referred to as moonwalks, bouncy castles, moon bounce, etc. Bounce houses are generally made with 18oz vinyl and are stitched with industrial threading. There are chambers inside called baffling that directs the air to keep the structure inflated. Over the years, your basic bounce house castle has evolved. Today you can rent or purchase a bounce house with many designs, from animals to construction designs, as well as, the most popular themes such as your Disney and Nickelodeon favorites. There are many manufacturers to purchase bounce houses from, as well as other types of inflatables. Most inflatables are manufactured in Asia and America. Bounce houses come in many different sizes, from the smaller 10’x10’ houses to the larger 20’x20’ houses. The most common sizes for rental companies range from 13’x13’ to 15’x15’. These units hold an average of 4-8 children at a time depending on the size of the inflatable. The most popular venues for bounce houses are generally at events where children are. You will find children at your local church or school for festive events and celebrations. 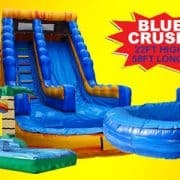 January 6, 2019 /by Xtreme Jumpers and Slides, Inc.
Largest Selection: We have more than 40 slides and water combos to choose from in our inventory- large, medium, small sized, single and double lanes with numerous themes. Highest Sitting Platforms: What is the sitting platform? It is actually the height that you sit from. We build our slides with the highest sitting platform possible, while our competitors have lower sitting platforms to save money and inflatable slide weight. Wider Slides: Our slides are from 11.5 ft. to 13 ft. wide allowing for a wider sliding lane. The average inflatable slide lane is only 9 to 11 ft. Larger Pools: All of our slides come with large pools that wrap around the entire front of the slide. Our slides are wider with larger pools. Misting Systems: All of our slides have top misting systems and our two-piece slides have a separate misting system for the attached slip and slide. The majority of our competitors do not have this option, which leads to a lack of “slip” in your “slip and slide”. Slide Stability: All of our slides have large stability pads to help stabilize the taller slides. Just Plain Fast: We have the highest sitting platforms and steepest drops. Riders will make it to the pool with our slides, while our competitors only slide halfway down. Colors and themes: Our variety of slide colors and themes is unmatched in the rental industry (check out our wide selection of bouncer themes). November 8, 2018 /by Xtreme Jumpers and Slides, Inc. Ever wondered just how safe is your bounce house rental? When it comes to children’s birthday parties, bounce houses and water slides have gained an enormous amount of popularity across the United States. These inflatable play structures are not just isolated to backyard rentals like the early days of the bounce house. Today, they are used as entertainment at all kinds of events and venues, including churches, schools, corporate events, community events, family reunions, and more. With the rising demand of bounce house rentals, there are inflatable rental companies opening at a staggering rate across the country. With the increase of bounce house rentals, there is also a notable increase in bounce house-related injuries. Most Americans hear about this incidents when a bounce house blows away and it is reported by a local or national news outlet. What the general public doesn’t hear about are the injuries that do not make the news but occur each weekend across the country. These injuries can be as minor as a scratch and escalate to more serious injuries such as a sprained ankle or broken arm. A vast majority of these injuries could have been avoided by hiring the right bounce house company and following some simple rules. So, let’s start with what to look for when hiring a bounce house company. When hiring your bounce house rental company, you want to be sure the company you select is licensed and insured. When the bounce house rental company is insured, it is a benefit, not only to the customer but also to the rental company for liability purposes. It also ensures the rental company is following the proper safety procedures and rules and regulations of the insurance company. Many small bounce house companies will not be licensed and insured simply because of the expense and accountability. 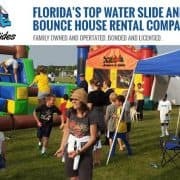 Once you have selected your bounce house rental company, the following should be considered and inquired about prior to the hired company leaving after set up. Proper inflation: If the unit sags or will collapse in the middle when pushing on the corner pillar, there is not enough air being pushed into and held by the unit. Proper anchoring installation- At the corner of every bounce house, there are anchoring straps. For grass setup, each corner strap should be anchored using a 12-inch stake, preferably made of rebar. Note: Pay attention to small plastic stakes, which are not designed to anchor the bounce house. For concrete setup, each corner anchor point should have a 50 lb sandbag attached. The condition of the unit- Check netting for big holes or large tears. Ground Levelness- An ideal set up is on level ground. A slight grade or slope is acceptable but must be almost unnoticeable. Power/ Electricity- Make sure a 12 gauge extension cord is utilized and the power supply is not overloaded. All loose clothing, jewelry, glasses, etc. should be removed. Clothing should be tied when necessary. Same sized and aged children should use the bounce house. No flipping, climbing the netting, or extreme horseplay allowed. Be vigilant to weather and winds approaching 15 mph. Deflate bounce house immediately. These simple steps in the bounce house rental company hiring process, as well as supervision during the event, will help ensure your party is safe and fun for all. September 30, 2018 /by Xtreme Jumpers and Slides, Inc.
That’s what John Scurlock named the vinyl matinal that covered tennis courts after seeing some of his employees jumping on it. John was a mechanical engineer from Louisiana and made 18oz vinyl into a bounce house. Today, bounce houses are called many different names by the general public. You will often hear them being referred to as moonwalks, bouncy castles, moon bounce, etc. Bounce houses are generally made with 180z vinyl and are stitched with industrial threading. There are chambers inside called baffling that directs the air to keep the structure inflated. Over the years, your basic bounce house castle has evolved. 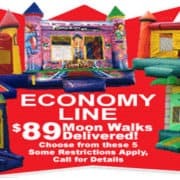 Today you can rent or purchase a bounce house with many designs, from animals to construction designs, as well as, the most popular themes such as your Disney and Nickelodeon favorites. There are many manufacturers to purchase bounce houses from, as well as other types of inflatables. Most inflatables are manufactured in Asia and America. Bounce houses come in many different sizes, from the smaller 10’x10’ houses to the larger 20’x20’ houses. The most common sizes for rental companies range from 13’x13’ to 15’x15’. These units hold an average of 4-8 children at a time depending on the size of the inflatable. The most popular venues for bounce houses are generally at events where children are. You will find children at your local church or school for festive events and celebrations. Bounce houses also work well to keep children busy at other types of events such as weddings, baby showers, and corporate events. Today, the most popular use for bounce houses are at children’s birthday parties. Due to the popular demand and the abundance of children’s birthday parties in every city across the United States, many entrepreneurs took advantage of the opportunity to open the bounce house rental market. The bounce house rental companies purchase the inflatables at an average cost of $1,500 to $3,000 in hopes of renting the bounce house to the market at about $100 per rental. Some companies have a simple approach and operate their companies as a part-time business. For the most part, these companies do not carry insurance and do not advertise all that well. There are also larger companies that carry a full line of bounce houses, as well as many other types of inflatables, and most of the time are licensed and insured. You can find most larger bounce house rental companies on social media, but you will mostly find them on Google. Bounce houses are a fantastic and cost-efficient form of entertainment for children of all ages. When planning your next event, remember the bounce house for your next event, and get ready to “inflate the fun”! February 4, 2018 /by Xtreme Jumpers and Slides, Inc. Looking for a better way to cool off in the hot summer months? These inflatable slides can be massive and can send riders at a very high speed down a steep slide that brings a big splash. The waterslide is made of 18oz vinyl and put together with industrial thread. The structure of the slide is formed with interior baffling that creates chambers that hold the air to form the design of the slide. Inflatable water slides can come in many different sizes, themes, and shapes. 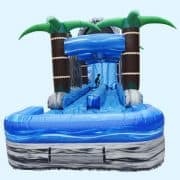 Being that most inflatable waterslide themes are driven around water, most of the themes will consist of waves, rocks, and palm trees. The color blue is generally always used in the making of the slide. There are many kinds of waterslides on the market, from single lane slides to double lane slides. The single lane usually has a wider sliding surface and allows for a single rider to go down at a time. The double lane waterslide allows two riders down at a time, but with their own narrow sliding lane. Waterslides also offer different ways to get to the top. There are stairs that go in the middle of the two lanes, stairs that are on the left side of the sliding lanes, stairs that are in the back of the slide that brings you to the front. The standard waterslides you find at backyard parties are generally one-piece slides that range from 12ft to 18ft tall with a pool at the bottom holding 12” to 18” of water. In the past 5 years, slide manufacturers have taken waterslides to a whole new level. Waterslides have become so large and popular that many hotels and resorts are buying them for the “wow” factor in extreme entertainment for their guests. These slides can be as high as 45ft tall and 170ft long. The hotel chains and resorts felt this was a good way to entice guests to return to their establishment in the hot summer months. These waterslides are extremely heavy and difficult to move, so once they are installed, they stay. There are also large waterslides that are pushing the edge of mobility and are put on trailers across the US to be delivered to all sorts of venues. These waterslides are usually a 2-piece unit that includes the large slide, and an attached slip n slide. These slides can be as large as 35ft tall and 85ft long. Many manufacturers make these slides from all over the world, and they end up in rental fleets all across the globe. These waterslides are measured from the bottom to the top of the façade. The sitting platform is where the rider sits before descending down the waterslide. In most cases, the average large slide has a 10ft façade at the top of the slide. There are several reasons that manufacturers do this. First, is it’s less expensive to make the slide using a lighter vinyl and no interior baffling in the façade because it isn’t a weight-bearing area. Another reason is the waterslide is a much lighter piece with the 10ft façade having no baffling and lighter vinyl. The better manufacturers have approximately a 7ft façade, which leaves the slide with roughly a 3ft higher sitting platform, which greatly increases the speed. In the southern region of the United States, waterslide rentals are very popular due to long warm summers. There are many rental companies to pick from, but as mentioned earlier, not all waterslides are created equally. When renting your waterslide, be sure to ask if it is a single or double lane slide? Does it have a front or rear ladder? One-piece or two-piece unit? But most importantly, always ask how high the sitting platform is. Waterslides can be a big splash for all ages and special occasions. January 8, 2018 /by Xtreme Jumpers and Slides, Inc.
Children’s bounce house birthday parties bring such joy and memories. Nowadays, there are so many options available for birthday parties- Chuck E Cheese, the bowling alley, movie theater, which can be quite costly. Even theme parks offer bounce house party packages. Local county parks, roller rinks, ice skating arenas are also possible options. In most cases, having a birthday party outside of the home is expensive, time-consuming, and sometimes, frustrating. There are many benefits to having a birthday party at home- more time to plan, no time limits or constraints, and less expensive, to name a few. Also, in most cases, more guests will attend an at home party because you can choose the times that work best for you and your guests, not based on the schedule of the bowling alley or roller rink. Many people choose one of those venues, like a bowling alley or ice skating arena because it will entertain the guests, but the unexpected fees and time constraints make for an unpleasant experience. Not to mention the lack of privacy when three other parties are being held at the same time. We often lose sight of the fact that our children are little for so long and birthday parties come to an end in the blink of an eye. There should not be a time limit on their memories and time with family and friends is priceless. So how do we entertain the children and have a party at home for friends and family to come relax and enjoy a special day? The answer is a bounce house or water slide rental. Over the years, inflatable bounce houses, water slides, and obstacle courses have become number one on the list for parents when planning parties. The reasons go far beyond feasibility and staying in the comfort of your own home. 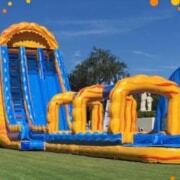 Let me show you why a bounce house rental or water slides rental is the best party option. Most rental companies offer 6 to 8-hour rental window. No time crunch. The customer chooses their party time instead of being pushed into a 2-hour time slot. Financially a water slide or bounce house rental makes better sense. Privacy in your own backyard- only the guests you invite will be there. Party guests don’t pay their own way which is awkward. All the comforts and convenience of your own home. More guests can attend because they can come earlier or later based on their busy schedule. 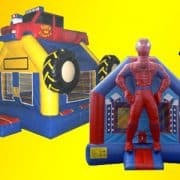 You can choose your bounce house theme to match the theme of your party. The smiles on the children’s faces are priceless when the inflatable is set up and delivered to their backyard and it’s there all day. On hot summer days, a water slide that makes a big splash is certainly a hit. 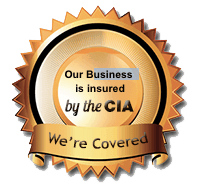 Be sure that the company is licensed and insured. Safety First, check out our video on how we safely secure a bouncer. Reviews- does the company have great reviews from previous customers? Flexibility- is the company flexible with the times you need? Does the company have an easy to navigate website, informational, and recognized by Google? answer the phone today, they won’t answer it on the day of the party if there are issues. December 15, 2017 /by Xtreme Jumpers and Slides, Inc.